In its nascent stage, our rapidly growing EMBL site in Barcelona consists of people from 13 different nationalities, speaking a multitude of languages. We often find ourselves curious about each other’s cultures, so we thought – what could be better than celebrating festivals together in the most authentic way?! On April 6th, 2019, we came together to celebrate the Indian festival of Holi (marking the beginning of spring) in the beautiful town of Begues, situated in the Garraf massif, south-west of Barcelona. According to legends, Holi signifies the victory of good over evil. However, in modern times, it is a symbol of inclusiveness, friendliness, love and unbound joy. Amidst the uncertainty of weather prediction, people joined with their families and young kids with great enthusiasm. With a mix of traditional and bollywood music, Indian food and vibrant colors, we enjoyed ourselves to the fullest! While this was a first Holi experience for most of us in the unit, in the coming years, we look forward to many such cultural events inspired by traditions across the globe! The festive spirit left a lasting impression on each one of us, an example is this cute drawing made by Aina (daughter of Krisztina Arató), explaining holi to her friends at school. Thank you one and all for making it a memorable experience! EMBL Barcelona is now up and running for more than a year and, believe it or not, despite these first busy months of transition we’ve also managed to continue doing science. To prove that, is there a better opportunity than to present our work at a conference? Well actually, yes; to decide to do it in two consecutive meetings! Different conferences and workshops attract different members of EMBL Barcelona according to specific topics during the year. However, last March, two conferences seemed to be specifically tailored for the whole Barcelona unit, and in particular for James Sharpe’s group (which also includes myself). So, I packed my suitcase, and joined the majority of the group for a scientific trip. First stop Dresden, Max Planck Institute for the Physics of Complex Systems, to attend the inaugural workshop on “Image-based Modelling and Simulation of Morphogenesis” organised by Kyle I. S. Harrington (University of Idaho, Moscow, ID USA) and Ivo F. Sbalzarini (Centre for Systems Biology Dresden, Germany). I left a sunny and vernal Barcelona and arrived to a rainy and cold Dresden on March 12th for this four-day meeting. Thankfully, the warm welcome by the organisers and exciting science made up for the weather. 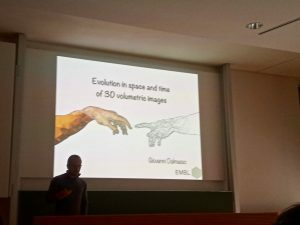 Indeed, some of the leading minds from different fields and expertise gathered in the valley of the River Elbe to discuss how computer modelling and bio-image analysis can improve our understanding of biological morphogenesis. EMBL Barcelona was probably one of the major contributors, since James Sharpe was one of the keynote speakers and three members of the lab were selected to give a presentation: M. Marin-Riera, A. Matyjaszkiewicz and myself. James Sharpe presented an overview on how we combine theoretical and experimental work to mechanistically explain limb bud morphogenesis in mice. Regarding myself, I had the opportunity to show in more detail one piece of the puzzle talking about some of the latest results of my current project: creating an evolution in space and time of a mouse limb bud using 3D volumetric images. Not much time to rest and visit the beautiful Dresden at the end of the conference, since we had just one day to catch a train heading south to our next destination: Heidelberg, where other members of James Sharpe’s and Miki Ebisuya’s group were already waiting for us. 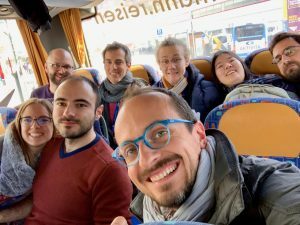 We crossed all of Germany to be ready on March 17th to take part in the EMBO-EMBL symposium: “Synthetic Morphogenesis: From Gene Circuits to Tissue Architecture” in EMBL headquarters. This meeting, organised by Stefano de Renzis (EMBL Heidelberg), Miki Ebisuia (EMBL Barcelona), Wendell Lim (University of California, San Francisco and Howard Hughes Medical Institute, USA) and James Sharpe (EMBL Barcelona), was particularly important not only for the eminent speakers, but also because this was the first time that we were, as a group, visiting EMBL’s main site since the site in Barcelona was born. The symposium focused on “Synthetic Morphogenesis”, a novel field that brings together different scientific communities from developmental biologists to chemists and material scientists. This new area aims to understand how cells/tissues/organs can be built de novo starting from isolated components. Being part of the discussion of a new field is nothing short of exciting. Attending two conferences in a row was quite intense but it ended in new ideas, suggestions and collaborations that will certainly improve my current research. Moreover, in addition to discussing and contributing to groundbreaking science with experts from all over the world, there is always a chance to meet old friends, find new ones and strengthen the bond with colleagues. Not many jobs allow these privileges, and that is why I enjoy being a scientist. I still remember how, the day I joined EMBL – one of the world’s leading research institutions – as a legal advisor, I was informed that its Council of Member States wanted to open a new site in Spain, and I would be responsible for its legal set-up. For a specialist in international law, being so fortunate to participate in the establishment of a brand new site of an intergovernmental organisation is a rare gift. Only a few days later, my colleagues and I were already in Madrid negotiating with the Ministry. Over time, the Host Site Agreement was approved, and I finalized a complex set of agreements for the use of the premises and for the collaboration with other on-site institutes. Of course, that was not the end, there was plenty left to plan and prepare before the day when the international treaty establishing EMBL Barcelona was published in the Spanish Official Gazette! That happened on 12th May 2017 and EMBL Barcelona was officially born. The site started a new phase, and so did my career. I was charged, as the first Head of Administration and Senior Legal Advisor of EMBL Barcelona, with turning the plans we set on paper into a reality – and to deal with every challenge that could come along the way. This is how one day I left the busy EMBL Heidelberg headquarters to arrive to an empty basement in Barcelona. I was alone, with just a table, a chair and an office, not even a working phone line yet. I was looking forward to work with the beautiful sea views of the PRBB building, but the refurbishment was still in progress. And yet, my makeshift workspace somehow contributed to the feeling of adventure. With the invaluable advice of my colleagues at EMBL and at other international organisations, I started planning the administrative strategy and team composition, networking with national authorities and research institutions, making sure that EMBL’s legal status as an international organization was correctly implemented. I delved on everything from legal topics, human resources, budgets, purchases, new grants, ethics… even helped follow up the refurbishment of the site! Little by little, EMBL Barcelona was taking shape. James Sharpe, the Head of Unit, and his group, joined in October 2017 and we started to grow together as a team, as a site. Researchers and administration working together towards the same goal, with a true interest in what the other was doing, supporting each other and with this feeling of purpose that one could sense in the air. We set our sights high and made every effort to achieve the goal of establishing a collaborative and pioneering scientific site. 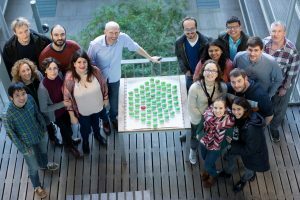 EMBL Barcelona now has three research groups and an imaging facility up-and-running, two more to arrive during this year, and two more to be recruited next year. We still encounter new set-up challenges, but now we also have to meet the needs of an operating site that is ramping up very fast. Getting here would have been simply be impossible without my fantastic administration team, who capably deals with those unexpected challenges that every day brings and reliably manages our day-to-day needs. I am still filled with excitement, and a myriad of ideas and initiatives for the future of EMBL Barcelona. Seeing it growth and getting progressively embedded with the national scientific and institutional landscape has become a great source of personal satisfaction, team pride, and motivation to keep on developing it. When I stop and look at it, I realise that, someday soon, this embryo that grew so fast into an adult will be key in contributing to unveil the unknown processes behind how tissues and organs function and develop, in health and disease. Everyone who directly or even obliquely participated in the creation of EMBL Barcelona should be proud; I know I am. Our new EMBL Barcelona lab spaces were completed by June of last year, and my own group moved in during July. Eerily empty spaces at that time, but they’re looking much more lived in by now – we’re rapidly growing: The admin team – headed by Amaranta Amador – has been our key to success from day 1, and has grown during the year into a wonderful team of 4, running everything from purchasing to PR. Last July our first newly recruited Group Leader arrived – Miki Ebisuya, from the RIKEN Center for Biosystems Dynamics Research in Kobe. She’s been bringing her group across gradually – two more members of the lab will be arriving here in a couple of months. A few months later (October) our next group leader started – Vikas Trivedi, arriving from his post-doc in Cambridge. 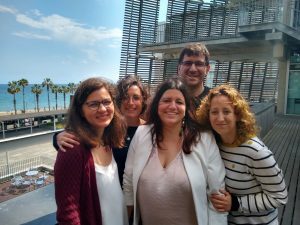 Both groups have been recruiting staff, and we also welcomed EMBL Barcelona’s first 3 new PhD students! At the same time the Mesoscopic Imaging Facility got seriously underway – Jim Swoger (head of the facility) recruited 2 more staff, so the unit has a full complement of 4 (with a diverse array of backgrounds from physics to biology) – they’re ready and waiting to scan your favorite tissue, embryo or organoid. This period has been both challenging and exciting. Trouble-shooting the new labs, getting our purchasing system up-and-running, testing and installing new equipment – and getting to know each other. One of the key biological features we’re studying is self-organisation of multicellular systems. This is a great metaphor for how we ourselves are functioning! Like a true “self-organizing system” everyone is pitching in, helping each other, working as a team, so that together this great new project is rapidly emerging into reality. Happy Lab Warming! Author sharpePosted on 6th March 2019 Leave a comment on EMBL Barcelona: Lab-warming Party! !